Nowadays, people can get smart wearable accessories that ease up banking transactions even more. You will find a number of people doing online money transfer through their smart watches, fitness trackers and different miniature wearable products. Therefore, manufacturers of miniature smart devices have now become a prime concern among a number of industries. NFC data security technology is innovative and upgraded. Infineon Technologies AG in unison with MPS or Mobile Payment Solutions based in Beijing has jointly launched this superb data security NFC model to increase the data protection uber. The innovative plug-in system for data protection is optimized with the inclusion of NFC antenna and hi-tech software. The size of the module is around 4mm x 4mm. MPS has got Finance Secure Element Certificate from China Financial Authentication body of People’s Bank of China (PBOC). MPS has been certified to release this NFC model for upgrading smart wearable devices along with the online mobile banking facility. According to Wang Yanzhong, general manager of MPS, this new technology is far better with superb low power consumption and small footprint on PCB. 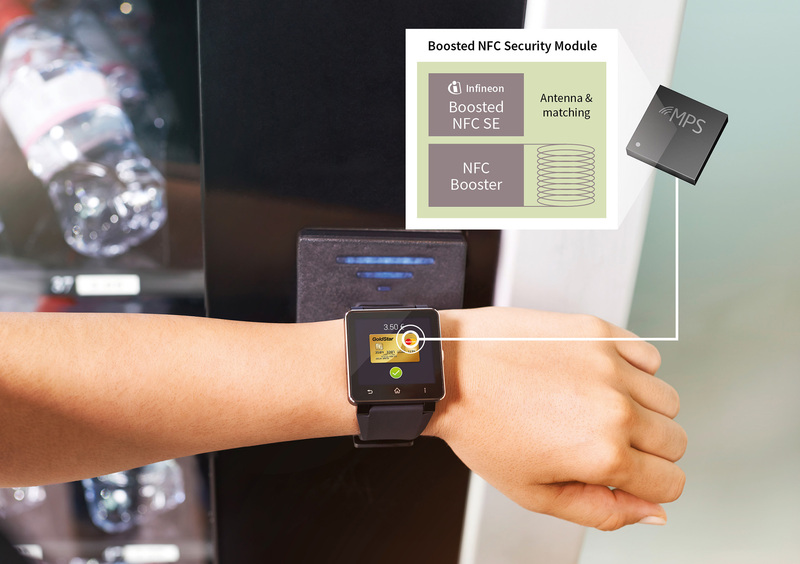 So, people usually prefer such upgraded Infineon’s NFC security models to get more advantages using IOT. In this connection, remarks of Thomas Rosteck are very valuable to consumers. The vice president of Infineon has stated that IOT enabled technology will be opted by millions of people in the near future. Improved NFC system will increase the revenues earned by the company. The hardware and software accessories are easy to install NFC models. Boosted NFC Secure Element pack has newly upgraded NFC antenna and other chips for easy installation. The PCB footprints are reduced by 75 percent. It is also less hazardous to develop or upgrade the NFC platform. The Java security system card is installable in any NFC Security Element. At the same time, Booster NFC tool can be used to rerun the old systems and have the fast online mobile money transfer option. Therefore, it is a convenient platform for new and returning customers. They can now choose this Booster technology for high speed online banking. Booster has flagship SLE78 security chip for enhancing round the clock data security and fast online navigation. The data storing capacity of this security chip is 1 Mb. It is helpful for consumers to do the data management and use different online applications whenever required. Infineon in collaboration with MPS in Beijing has given a complete new look and speed to the NFC model along with top-end data safety. People will be happy when they will release or receive fund through their wearable products like smart watches. Their bank information will be completely protected from hackers. MPS has been selected to compete in London to have Contactless Intelligence Award for introducing hi-fi Booster NFC module to develop the miniature smart wearable devices and support to complete online money transaction.